Trend forecasters have called gochujang “the next Sriracha,” and chefs are using the spicy Korean sauce in much the same way. Noodles & Company, the fast-casual concept with a global menu, adds gochujang to a bold barbecue sauce. The meatballs combine ground chicken and beef. 1. For sauce: In large saucepan, combine ginger, garlic, soy sauce, brown sugar, vinegar, gochujang, sesame oil and chili flakes; bring to a boil over medium heat. 2. Whisk cornstarch and water; stir into boiling sauce until thickened. Reduce heat to medium; simmer 5 minutes. Keep warm. 3. For meatballs: Preheat oven to 350 F. In large bowl, mix chicken and beef with eggs, salt and pepper. Roll into 1-ounce balls and place on oiled sheet pan. Bake in oven about 20 minutes until browned. 4. Add meatballs to warm barbecue sauce and toss to coat completely. 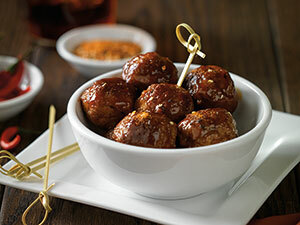 To serve, place sauced meatballs on platter; garnish with sesame seeds.